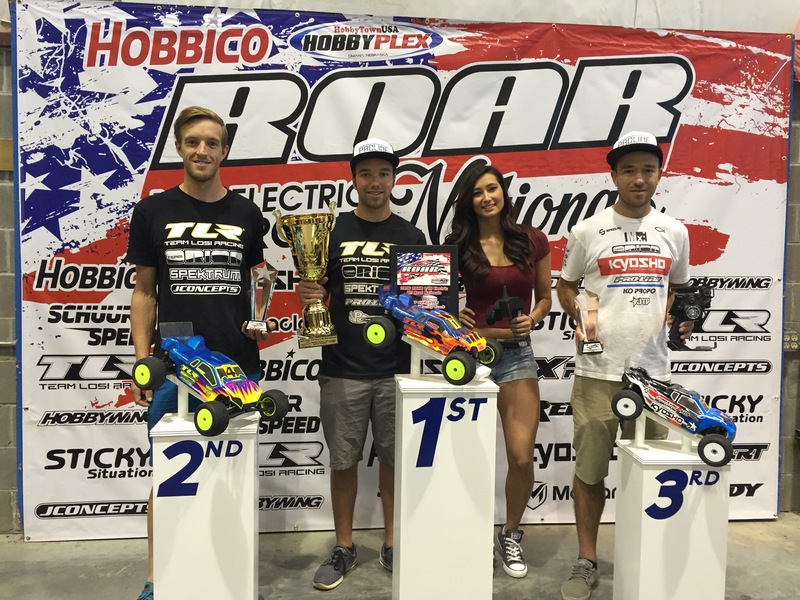 It’s time for the 2016 ROAR 1/10 Nationals, held in the midwest this year! 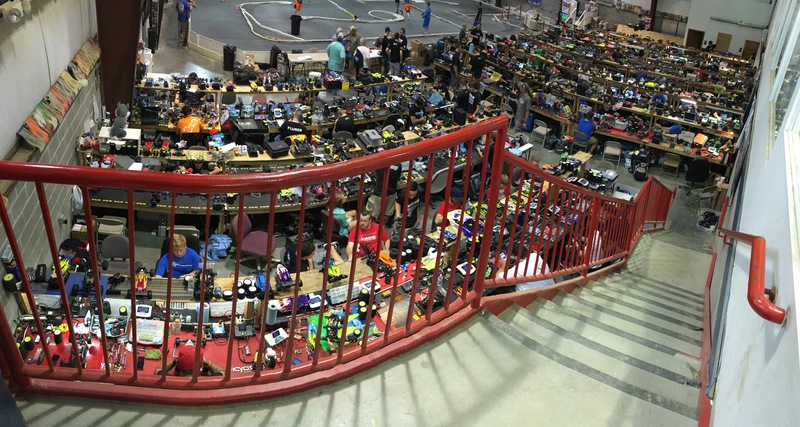 It’s actually pretty close to me, so I can drive my own car to the race: Omaha, NE at The Plex at Hobby Town. I have been putting in the work for the 1/10 Nats and made a trip up in June and July to race the Summer Series they host, so I was excited for the week to start. I drove up Wednesday morning and would get there for the 10am start time of open practice. Wednesday would be open practice, Thursday controlled (seeding) practice, Friday Q1 and Q2, Saturday Q3 and Q4, and Sunday all the Mains. The track looked good, pretty technical, but nothing too difficult, looked good for racing as well. I was starting with my car setup’s just like how I left the last day I was racing up there in July. I had my tires all mounted and my whole game plan for the week ready to roll. I hit the track and the first day didn’t seem to go as I had thought. I searched for traction ALL day, I just never felt in the track, and it was getting frustrating. I knew my setups were close, and the other top PL drivers were going good, I didn’t know what was going on. This track is all about tires, so I figured that must be where my issue is. I had my game plan on my tires, break them in on the drill, only using a rag with sauce, and then a dry rag to get them hot. It just wasn’t working though. Thursday was here and I was praying that the track broke in more and that my tires would be good for the track and I would have the speed. First round of seeding and all my cars felt the same …. NO TRACTION. My tires weren’t squealing at all either, and the guys that had good grip, their tires would be squealing. I knew it wasn’t tire sauce, because the race was a spec sauce, and everyone seemed to be playing fair and using the correct stuff. My PL teammate, Phend, he was SUPER hooked up, so I was asking him and the PL guys what the deal was. They helped me on Wednesday and told me what they were doing to Phend’s tires, and I was trying to replicate it, but it wasn’t working. I finally gave in and had them do my tires for the final seeding run. I did not change anything on my cars, and the difference was just UNREAL! I was finally into the track, and I went over 1 second faster in my seed time in all 3 classes, over 2 seconds faster in 2wd. After finally driving the track with some good traction, I was able to see where my cars were. Truck was pretty good, so no changes there, 4WD was also pretty good, so nothing there either. 2WD was not where it needed to be, lacking the middle of the corner speed I wanted. I decided to move the shocks from the back of the arm, to the front of the arm. I ended up just staying at the track, Face Timed my wife, and worked on getting everything ready for qualifying. The entire pit area was empty, and it was actually very peaceful, as I got to talk with my wife, which is rare when I’m gone, so it kinda felt like being at home. I left the track at 11:30PM. Friday was here and my mind was a bit of a mess! I had this whole plan for the week, plan for tires, plan for setups and how my cars were going to drive, and the plan FAILED! My tire program was struggling when I was doing it, so I gave those duties up to Lewis from PL, which is very hard for me to do. 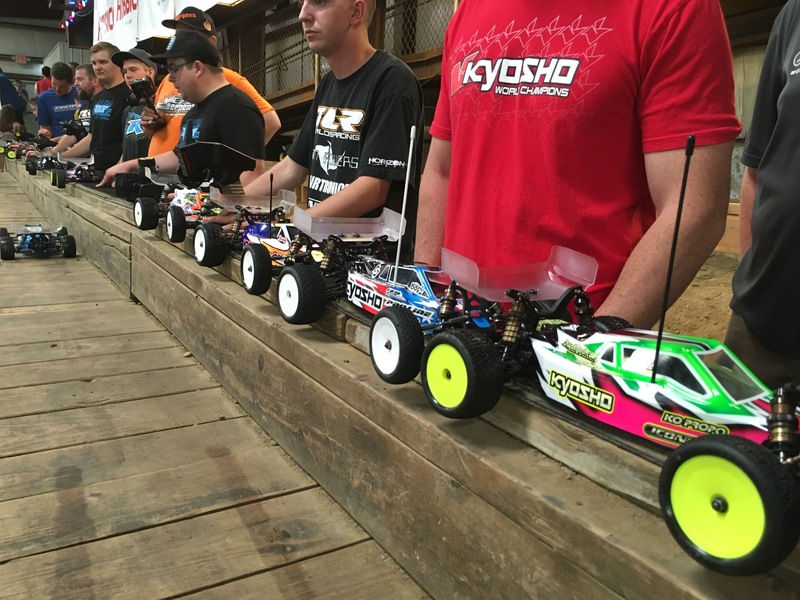 My 2WD was in a configuration that I wasn’t sure how it was going to drive, and qualifying was about to start. The morning practice went great, so I was ready. Q1 started with Truck. The qualifier started out really great, I was feeling fast and driving good, but my truck was a little hard to drive. I was leading the beginning of the heat, but then had a bobble and battled back to just miss 2nd, so I got 3rd. 2WD was next and I was nervous and excited! The start was great and I was leading right away, and my car was feeling perfect. Maifield briefly took the lead, but then I took it right back and was driving with confidence, this was the change I needed for my weekend to get back on track. With about a minute to go, the whole run would EXPLODE. I got a little off my line coming onto the front straight, off the big drop off, when I landed the car pulled a wheelie and then jumped side to side. I couldn’t do anything to save it and I went flipping down the straight, hoping to land on the wheels, but I landed upside down. I got fumbled some with the marshal and lost even more time. I was trying to stay calm and just get back into my flow, but I crashed again only a half lap later. I went from leading and about to TQ, to 16th for Q1. I was bummed for sure. 4WD was last and I was ready to put 2WD behind me. I had a decent start and was feeling ok, nothing special, but had a weird moment on the front straight after the drop off again, this time just getting out of shape and bouncing off the inside pipe. unfortunately the inside pipe has couplers and they grabbed my front wheel nut, ripping the left front off my ZX6. Q1 was a rough start to qualifying! Q2 truck was pretty good. I had good pace and had a cleaner run, taking 2nd. 2WD I just didn’t get in my flow I had the first round and made some costly mistakes, finishing 10th. 4WD would be a good drive and a clean qualifier to get 5th. Saturday was here and I was feeling better, had a good night sleep, and had a good grasp on my tires, my setups, and I knew my speed was there too. Q3 of truck I had the best speed of all my qualifying, but had a few big crashes that dropped me back, so I finished 6th. 2WD I knew I needed really good runs to get a good starting position. My plan was to just go for it and go for two TQ runs from the B heat and get the overall TQ, I have done that before and I was confident I could do it again. The track was changing, getting a TON of weird dust off the line, a mix of dirt dust and tire rubber dust. The line was narrow, and the dust was SKETCHY! Some drivers were going to taller pinned tires, to handle the dust better. I ran a set of tires that I had prepped and had more tread than what I ran in Q1 and Q2. That was a TERRIBLE choice. I had no traction again and had no speed. I drove really well for the feeling I had, but had one very costly crash in the sweeper and got 8th. For 4WD I ran similar tires to Q1 and Q2 and tires that Lewis prepped, and my grip was amazing again. I had a good drive to get 4th. Q4, the final qualifier. Truck was awesome and I drove well to get a 2nd and secure 2nd overall. 2WD I needed a top 5 to get into the main. I wasn’t nervous at all, I knew that with the correct tires I had tons of speed and my car has been perfect. I was the second car to start the qualifier and on the first lap, the car in front of me crashed off the triple, I had plenty of room to pass on the inside, so I went that direction and thought….awesome….now I’ll have clean track, I got this! Next thing I know, the marshal flips the car right in my path, we hit and I go crashing. I have to get marshaled and then the car that started behind me, passed me. The times had been SUPER close in all of qualifying, so I knew I had to hammer down now to get a top 5. I got back into my groove and reeled in the car in front of me, but he was the car leading the qualifier. I was driving as close as possible to him, hoping to make him nervous, but not touching him. My plan worked and he went a little wide and I dove inside to make the pass. That was my one chance and I think I was just too excited that I actually got back infront of him, that on the very next lap, I went wide after the triple. I got into the dust, I had a quick decision to make….close the door and try to stay in front, possibly crashing him and, or me, hindering both our times….or give up the spot and most likely miss the A Main. I decided to give up the position, it was my mistake that I made, and I wouldn’t want somebody to do that to me. I stayed glued to his wing for the rest of the qualifier and I ended up 10th. I was pretty devastated and really just couldn’t believe it. Qualifying started out in 2WD with an almost TQ, my car was driving AMAZING, and now I missed the main, I could have just broke down in tears! I left the track for a bit to cool down and get some dinner by myself and get ready for Q4 of 4WD. I would have another solid run, not super fast, but clean, getting 4th. SUNDAY SUNDAY SUNDAY!!! Race day was finally here, I wanted the win in truck bad! A1 time was here and I was ready. My speed was pretty good, but just silly mistakes. I dropped back to 4th early, and then got into my groove. Passed into 3rd and set my sights on Rivkin in 2nd. I would catch him from 3 seconds back and we would battle it out on the last lap, and I would get next to him on the straight. I went for a last second outside to inside pass in the sweeper, but he read my move and braked early, resulting in us colliding and flipping to the finish. I would take 3rd. A2 I knew I had to bring it! Phend was on fire this whole weekend, taking all 3 premier Mod class TQ’s and he won A1. I started off really fast, staying right with Phend, even showing I was faster. My plan worked, it caught him off guard and he started to make mistakes. I pressured him for the first 3 laps, even bumping him some, then he cracked….making a mistake before the triple, casing the jump, but I landed on his truck and crashed while he kept going. I dropped back about 2 seconds, but I wanted to keep that intensity and reel him back in. On the next lap though, that DARN drop off got me. I wheelied a little going off and it dropped my front end, and I ended up stuck on my roof on the front staright…..FREAKING AGAIN! I dropped back to around 5th or 6th and worked my way back into 3rd at the end. A3 I just needed to drive my own race and get the win to take 2nd overall. My truck seemed tough to drive the first few laps, then it would always be amazing to the end. I started good, pulled a small lead the first lap, but then went on two wheels in the sweeper and gave up the lead. I quickly got to the back of Rivkin, I was much faster, and he started to make a ton of little mistakes. This caused the top 6 trucks to be bumper to bumper. A couple of laps passed by and then Rivkin bobbled in the back section, clipping the inside pipe. As I was passing him to take over the lead, he came off the pipe and clipped my rear tire, sending me on my roof. I went from 1st to 6th. I then got caught up in another truck that crashed in front of me, so I was getting frustrated. I thought my podium overall was gone. I got back into 4th and reeled in the battle for 2nd before the final lap. On the final lap, 2nd and 3rd got tangled, there was a small gap on the inside, and I took it! I finished 2nd and that gave me 3rd overall! 2WD B Main I would start 5th. My car felt really really good, so I was excited to battle through the pack and go for the win. I got a great start and started to move forward early. I got into 3rd and then the darn drop off got me again. I must have just been too aggressive through that section. I got just a little off my line, and my car went off the drop really upset and swapped out after landing. That dropped me WAY back, around 10 seconds off the leader. I charged hard and clicked off super fast laps get all the way back up to 2nd and almost catch the leader. 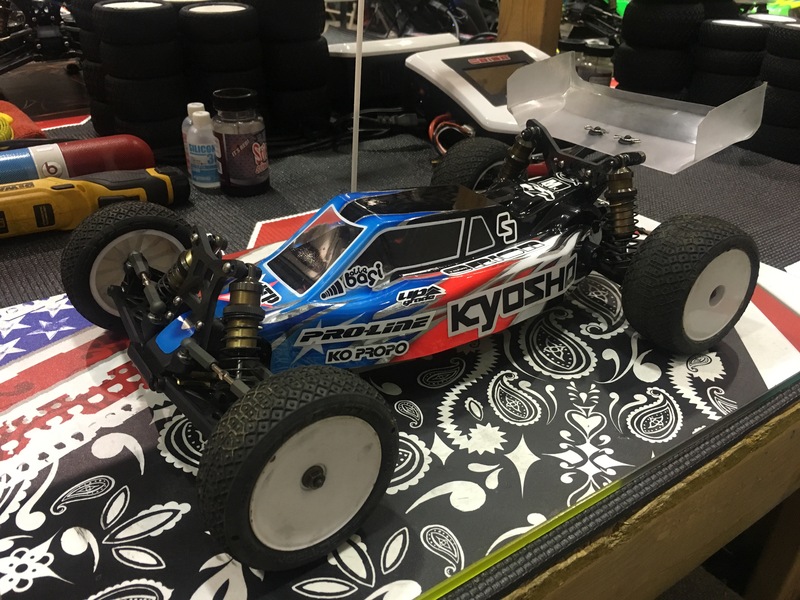 My new Kyosho RB6.6 was perfect all weekend, racing can be cruel sometimes. 4WD A1 was off to a great start, the entire field in qualifying order and I was staying right there with the pack in front of me. I didn’t have the raw speed I needed in 4wd to fight for a podium, but I was right there to battle for 4th and capitalize on any mistakes in the front. I made the mistake though and flipped in the sweeper, popping off my ball cup and ending my race with a DNF. A2 would be pretty similar early, except I would move up to 4th after a mistake by Tessman. I was feeling good, but then just a costly bobble. I clipped the pipe after the sweeper and rolled over, dropping me way back. I couldn’t do much to catch up and I had to settle for 7th. A3 I crashed first lap and dropped to 7th, but was still in the racing pack. A few laps into the main, I was headed down the straight full throttle…..BOOM….Rivkin’s car was just sitting there, I’m not really sure what happened, must have tangled with another car, but my front end exploded. That topped off my weekend. Racing can be a very much LOVE/HATE relationship, and this weekend was a big test for me. I was happy that I handled all the situations like a professional and never gave up in any of my races. I will learn from my mistakes and move on to the next race! 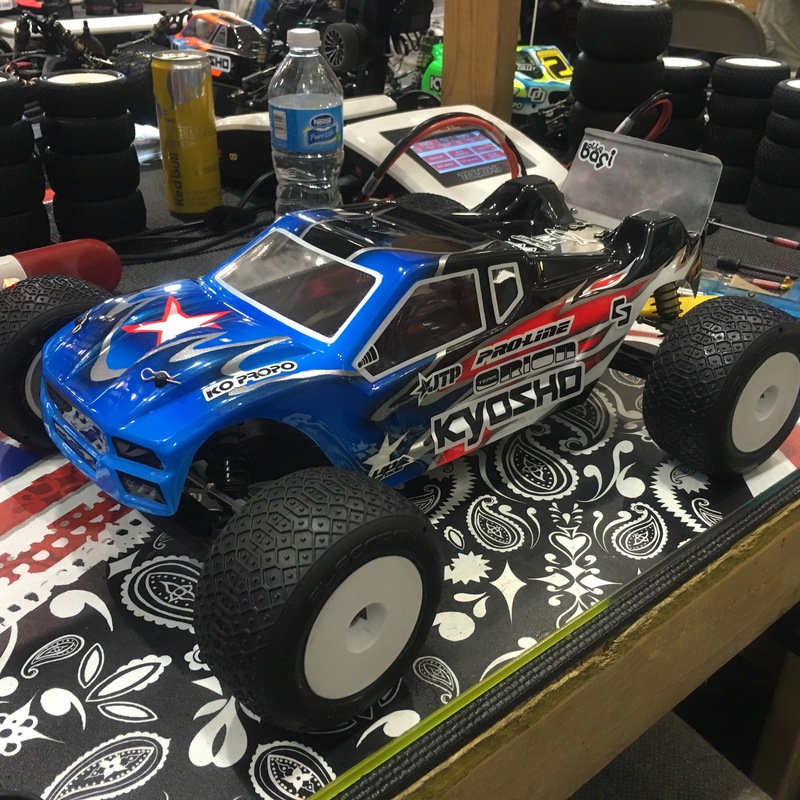 Thanks to all my great fans, friends, family, sponsors : Kyosho, Orion, Proline, MX, KO Propo, Speed RC, Upgrade-RC, TD Paint, Lunsford, Rock Brook Church, and thanks to the Good Lord Jesus Christ! Thanks for reading, and God Bless! Hi Jared, Love the fact you thank our Lord and savior in all of your posts. We definitely need more of this today. Thanks for all your kind words, sorry for such a long delay in response. Yeah, some people are better than other at tire break in, for me, the tires seem to be the most important thing with 1/10 indoor racing. We were just getting the tire temperature really high and then putting sauce on them while the pores of the rubber were open. Not all tire brands are like that. I never did that with AKA, and I don’t see JC guys doing it either. Seems like there are different methods with each brand of rubber. Hi Jared, Love the fact you thank our Lord and savior in all of your posts. I just wasn’t getting them broke in correct. 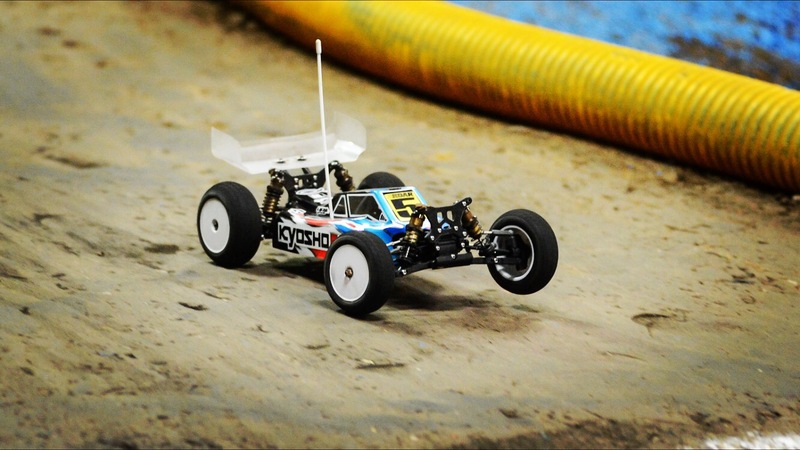 1/10 indoor racing is all about the tires, and some people are better than others at the art form. For me, I was saucing them before I broke them in, and I couldn’t get the tires hot enough after they already had sauce in them. 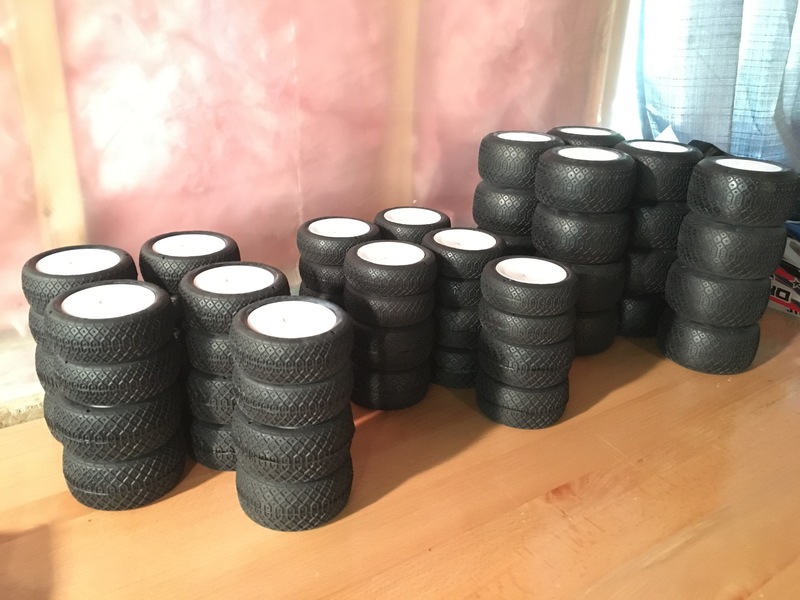 Have a question regarding tire prep. What exactly were you guys doing to gain more traction. I’ve tried breaking in tires before hitting track, tire sauce, different car setups, etc…but just never seem to get the “stuck to the track” traction that I see so many other racers get. Any help would be greatly appreciated. Thanks again and congratulations on all your current/future success. You are an A1 class act all the way. God Bless!